In a city near our home, our family frequently visits a low income nursing home. 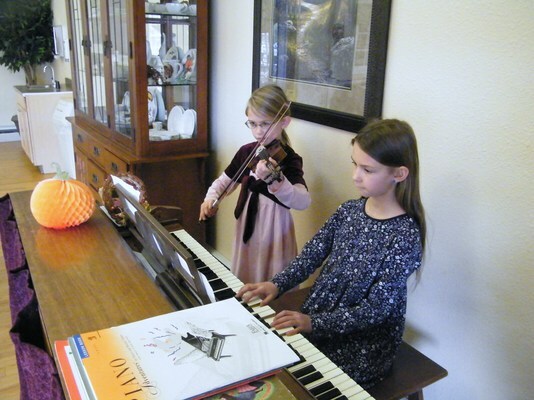 My sister and I like to play our piano and violin pieces for the residents. Our family has dear friend there, her name is Miss Louise. One day while visiting her, we had a long, touching conversation. One of the questions my Dad asked her was, “How far away does your son live from here?” She responded without any hesitation, “My son lives about fifteen minutes away from here. He has a big house with five acres.” With this answer I wondered why she didn’t live with her son. My Dad continued with the same thought, “Do you like living here?” To my surprise, she answered, “I like it here, it’s nice.” After talking about subjects in school, how many brothers and sisters I have, and some questions like that (even though I had answered those questions about five times) it was coming time for us to leave. Saying good-bye I gave her a hug. She almost started crying. Gratefully she said, “I haven’t had a hug in so long! Thank you so much.” I felt so touched by the fact that a simple hug could brighten her day so much. It was a sweet opportunity to spend time with this lonely elderly lady. I have enjoyed going to nursing homes and hope to go to more in the future.